Composite construction comes with its own set of disadvantages, the most important of which is the lack of visual proof of damage. Composites respond differently from other structural materials to impact, and there is often no obvious sign of damage. For example, if a car backs into an aluminum fuselage, it might dent the fuselage. If the fuselage is not dented, there is no damage. If the fuselage is dented, the damage is visible and repairs are made. In a composite structure, a low energy impact, such as a bump or a tool drop, may not leave any visible sign of the impact on the surface. Underneath the impact site there may be extensive delaminations, spreading in a cone-shaped area from the impact location. The damage on the backside of the structure can be significant and extensive, but it may be hidden from view. Anytime one has reason to think there may have been an impact, even a minor one, it is best to get an inspector familiar with composites to examine the structure to determine underlying damage. The appearance of “whitish” areas in a fiberglass structure is a good tip-off that delaminations of fiber fracture has occurred. Figure 3-16. 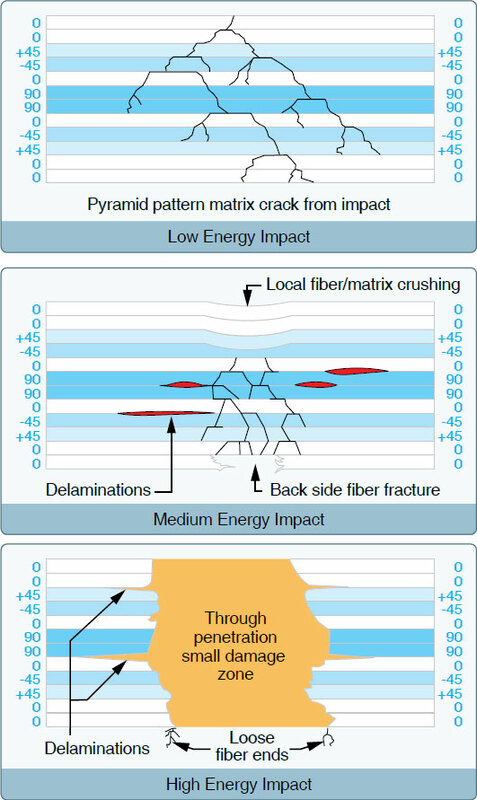 Impact energy affects the visibility, as well as the severity, of damage in composite structures. High and medium energy impacts, while severe, are easy to detect. Low energy impacts can easily cause hidden damage. If an impact results in delaminations, crushing of the surface, or a puncture, then a repair is mandatory. While waiting for the repair, the damaged area should be covered and protected from rain. Many composite parts are composed of thin skins over a honeycomb core, creating a “sandwich” structure. While excellent for structural stiffness reasons, such a structure is an easy target for water ingress (entering), leading to further problems later. A piece of “speed tape” over the puncture is a good way to protect it from water, but it is not a structural repair. The use of a paste filler to cover up the damage, while acceptable for cosmetic purposes, is not a structural repair, either. The potential for heat damage to the resin is another disadvantage of using composites. While “too hot” depends on the particular resin system chosen, many epoxies begin to weaken over 150 °F. White paint on composites is often used to minimize this issue. For example, the bottom of a wing that is painted black facing a black asphalt ramp on a hot, sunny day can get as hot as 220 °F. The same structure, painted white, rarely exceeds 140 °F. As a result, composite aircraft often have specific recommendations on allowable paint colors. If the aircraft is repainted, these recommendations must be followed. Heat damage can also occur due to a fire. Even a quickly extinguished small brake fire can damage bottom wing skins, composite landing gear legs, or wheel pants. Also, chemical paint strippers are very harmful to composites and must not be used on them. If paint needs to be removed from composites, only mechanical methods are allowed, such as gentle grit blasting or sanding. Many expensive composite parts have been ruined by the use of paint stripper and such damage is generally not repairable. Some owners are concerned about fuel, oil, or hydraulic fluid spills on composite surfaces. These are generally not a problem with modern composites using epoxy resin. Usually, if the spill does not attack the paint, it will not hurt the underlying composite. Some aircraft use fiberglass fuel tanks, for example, in which the fuel rides directly against the composite surface with no sealant being used. If the fiberglass structure is made with some of the more inexpensive types of polyester resin, there can be a problem when using auto gas with ethanol blended into the mixture. The more expensive types of polyester resin, as well as epoxy resin, can be used with auto gas, as well as 100 octane aviation gas (avgas) and jet fuel. Lightning strike protection is an important consideration in aircraft design. When an aircraft is hit by lightning, a very large amount of energy is delivered to the structure. Whether flying a light general aviation (GA) aircraft or a large airliner, the basic principle of lightning strike protection is the same. For any size aircraft, the energy from the strike must be spread over a large surface area to lower the amps per square inch to a harmless level. If lightning strikes an aluminum airplane, the electrical energy naturally conducts easily through the aluminum structure. The challenge is to keep the energy out of avionics, fuel systems, etc., until it can be safely conducted overboard. The outer skin of the aircraft is the path of least resistance. In a composite aircraft, fiberglass is an excellent electrical insulator, while carbon fiber conducts electricity, but not as easily as aluminum. Therefore, additional electrical conductivity needs to be added to the outside layer of composite skin. This is done typically with fine metal meshes bonded to the skin surfaces. Aluminum and copper mesh are the two most common types, with aluminum used on fiberglass and copper on carbon fiber. Any structural repairs on lightning-strike protected areas must also include the mesh as well as the underlying structure. For composite aircraft with internal radio antennas, there must be “windows” in the lightning strike mesh in the area of the antenna. Internal radio antennas may be found in fiberglass composites because fiberglass is transparent to radio frequencies, where carbon fiber is not. Figure 3-17. 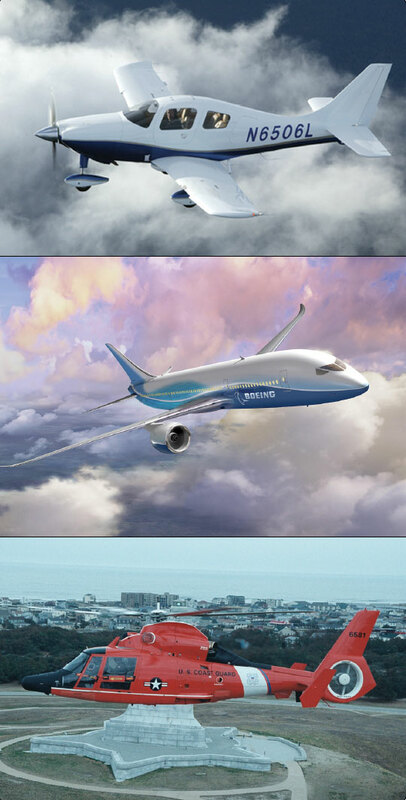 Composite materials in aircraft, such as Columbia 350 (top), Boeing 787 (middle), and a Coast Guard HH-65 (bottom).